There is no question that the pharmaceutical industry needs to take better advantage of emerging technologies to digitise and modernise the critical work that happens in the lab. In an age where the average four-year-old possesses expert iPad skills, too many labs still use paper notebooks to record experimental, material batch and equipment data and are overwhelmed and constrained by a multitude of repetitive and unnecessarily manual processes. Digitising data capture, process execution, knowledge-sharing and collaboration are imperative in today’s R&D environment. Every minute that drug manufacturers can shave from development, scale-up cycle times and quality reviews can potentially affect the bottom line. It is important, however, not to confuse the act of deploying new technologies with an effective digital strategy. Most labs already have some digital systems and procedures in place. But the real question is how to ensure that technology investments result in tangible return on investment (ROI) for the long term. Money will be wasted if systems are purchased that people don’t use, that lock organisational knowledge into silos, or add to rather than alleviate the complexity involved in managing company process and quality data. 1. Evaluate the baseline. Every journey has a starting point, and the transition to a fully digitised lab is no exception. Before an organisation can begin to evaluate potential new investments, it is important to take inventory of the processes and technologies already in place in your lab. What are the highest-volume and highest-value activities that people are engaging in on a daily basis? (these are not always the same thing.) What is working and what is not? Where are the biggest bottlenecks and the leading opportunities for improvement? Once areas that could benefit from digitisation have been identified, companies also need to think about how easy or difficult it might be to address them. Prioritise the ‘quick wins’. The last thing any business wants to do is start with an incredibly complex project that takes years to implement. Enthusiasm will wane, the longer it takes for something to pay off. And this brings us to another key baseline consideration: culture. What is the makeup of the company’s user base? Are they younger and more technically savvy? Or have they been doing things on paper for 20 plus years, making them resistant to change? This is important because the goal is to get people to embrace digitisation, especially the most experienced and valuable scientists, and they won’t go digital if they feel that the systems being deployed will make their jobs harder, rather than easier. Focusing on a project that has a simple learning curve and that will prove its worth quickly is a good way to win over the technology sceptics and set the stage for broader initiatives. 2. Digitise (and standardise) data capture. Paper, and lots of it, is still the dirty little secret in today’s pharma labs. Even in this electronic age, many labs still track equipment using paper logs and record experiments in paper notebooks. This simply has to change, as factors such as the global distribution of development operations and compliance requirements demand that R&D data be easy to access, share and search. Labs that continue to record information on paper will ultimately fall further behind the efficiency curve and lose their competitive edge, as they waste a substantial amount of time and effort entering and searching data. Repeated experiments and other forms of duplicate effort are also troublesome when existing knowledge cannot be easily retrieved and shared. For example, consider the problems that are created simply by keeping equipment logs on paper: suppose a lab is asked to show that one of its pH meters was properly calibrated on a specific date as part of a regulatory requirement. Finding a single needle of information in a haystack of log books could possibly take weeks, at the expense of research productivity. 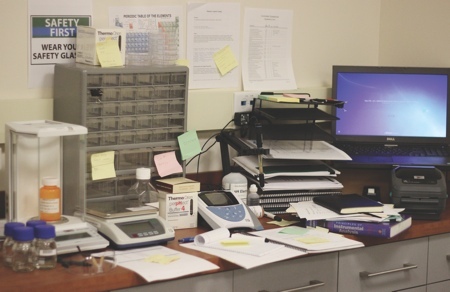 Replacing manual data capture processes is a critical first step towards modernisation, and today there are a number of informatics technologies, including electronic laboratory notebooks (ELNs), as well as chemical and biological registration systems, that can help organisations get rid of the paper. Standardisation is another key issue. Disjointed systems and paper logs invite inconsistencies in how data is recorded, which in turn makes it difficult to search and share. When laying the groundwork for digitisation, look carefully at how prospective data capture technologies handle standardisation. For instance, features such as dropdown menus and auto-complete suggestions can help make it easier for scientists to comply with naming standards. The importance of digitising data capture cannot be overstated. When all R&D data is recorded electronically (and in a standard, transparent and traceable manner), organisations can more efficiently address regulatory compliance, prepare for patent filing, collaborate with external partners and track all of the data relevant to research efforts from lab to plant. Cutting out manual processes and paper-based record keeping will also reduce the time spent on low-value data administration and improve overall productivity in the lab. 3. Focus on integration. In the early stages of lab digitisation, it makes sense to focus on bite-sized chunks and quick wins. But it is also vitally important to keep long-term objectives in mind, especially when evaluating new technology investments. Faster time-to-market, fewer delays and bottlenecks and improved compliance and collaboration will be fully realised only when scientific data can be easily used and shared across the end-to-end innovation continuum – from early discovery to safety and QA/QC testing, all the way through to production scale-up and manufacturing. Choosing tools that are too narrow or specialised in their focus will lead to a patchwork of disjointed technologies that lock data into disciplinary, task or departmental ‘silos’. Don’t simply replace paper pushing with the equally time-consuming need constantly to cut and paste or re-key digital data from different systems and applications. Instead, look for solutions that support broad access and usage throughout the organisation, and that are capable not just of capturing data, but also of integrating, analysing and running processes across it. However, trying to find one system that does everything can result in a hugely complex deployment that takes too long to implement and that won’t be adopted. There’s no need to rip up and replace existing technologies if the new system is based on an underlying informatics foundation that uses an open architecture and pre-built connectors to integrate multiple sources of data. The key is to be able to do this without customised and costly IT intervention. For example, consider the value of an ELN that can capture and automatically integrate data from Laboratory Information Management Systems (LIMS), Chromatography Data Systems (CDS), biological and chemical registration databases and even directly from laboratory equipment. Integrated informatics creates a collaborative lab environment in which many project participants can quickly and easily access, mine and use the data they need to move projects forward. 4. Automate, Automate, Automate. Integration sets the stage for automation. Once data is integrated, an organisation can begin to take advantage of platform technologies that automate the processes that either eat up a lot of administrative time when executed manually (high volume) or that increase the organisation’s competitiveness when accelerated (high value). Variable processes produce variable outcomes. From inventory management and sample testing to more complex standard operating procedures (SOPs) for Quality by Design-level QA/QC controls, the more manual steps that can be eliminated, the fewer opportunities there will be for errors and bottlenecks. Automation helps organisations ensure that the processes they deploy are efficient and accurate, and that problems can be spotted and addressed quickly – before a project is too far down the pipeline and a production line needs to be shut down or patent filing pushed back. It also encourages adoption. When scientists are freed from the burden of re-entering data over and over again and repeating tedious manual tasks (like cutting and pasting information from Excel, Word and PowerPoint to create an experimental report), they can focus more time and effort on their research and achieving positive outcomes. The key thing to remember with automation is to focus on data integration initiatives first. Processes automated before integration is complete will have to be re-designed once more sources of data are part of the mix. 5. Extend. 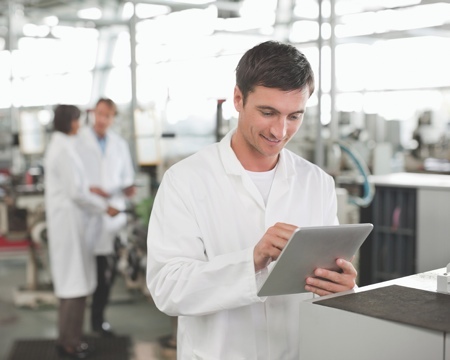 Once the company has a proven solution for capturing, integrating and automating lab data – one that has been successfully adopted by the user base in one of its ‘quick win’ categories – it is time to think about extending digitisation to other areas. This is where the flexibility and usability of the technology deployed takes on further importance. Can the ELN that the lab is using to capture experimental data in one department or for one project be scaled to another? Can the workflow for automated sample testing of chemical compounds be replicated for biologics? Is minimal IT help required to do so? If a solution that is built for broad usage, integration and accessibility has been identified, the answer should be yes. Other important questions are: Do the lab workers like it? Does it make their jobs easier without stifling their ability to innovate? Can they do what they need to do in as few ‘clicks’ as possible? Lastly, will the early adopters be willing to share their experiences and lessons learned? Finally, the concept of extensibility applies to data as well as technology. Far too much ‘single-use data’ is generated in laboratories. One project team or scientist runs an experiment, records the results in a paper notebook or runs an analysis in Excel, and the experiment is never seen or used again. Digitising the laboratory makes this data accessible and searchable to stakeholders throughout the organisation, up and down the idea-to-production value chain. And this greatly extends the mileage of the organisation’s most valuable asset: its hard-won intellectual property. Transitioning to a fully modern, fully digital lab requires a thoughtful and methodical approach. Organisations need first to evaluate where they are before they can plan where they need to go, then focus on strategically deploying technology for capturing, integrating and automating the data that drives product development, from early research to manufacturing. Consider this example from a global biopharmaceutical company: In an attempt to streamline data sharing and process execution and accelerate development across a globally distributed biologics portfolio, the organisation wanted to move away from an existing patchwork of disconnected technologies and paper-based processes. By deploying an ELN and underlying platform for data integration and process automation, the organisation has been able to transition, over time, to a centralised system that captures and manages all biologics data and replaces inefficient and fragmented processes with electronic automation and streamlined workflows. Close to 95% of the lab workforce is now using the ELN, and the department has stopped issuing paper notebooks. The entire organisation can now access data at any time using a central interface – from their desktops, in the lab, or from a mobile device. As a result, the data that drives innovation is being used more quickly, more strategically and broadly. This is the power of the digital lab.